A light, but flavorful and warming soup to start your new year! *I use 2 “Not-Chick’n” bouillon cubes dissolved in 4 c. boiling water. “Not-Chick’n” can be found in the organic foods section of many grocery stores. Place 1 T. of the olive oil in a large skillet. Add onion, a dash of salt, a twist of fresh ground pepper, and about 1 T. of the wine. Cook over medium-high heat, stirring occasionally, until onion is crisp-tender and translucent. Transfer to a stock pot. Place remaining 2 T. of the olive oil in the large skillet. Add carrots, paprika and cinnamon. Cook over medium-high heat, stirring occasionally, for about 10 minutes. Transfer to the stock pot containing the onions. Add enough of the broth to the stock pot to almost cover carrots. Stir. Cover and cook over medium heat until carrots are tender enough to purée but are not mushy, about 15 minutes. Stir in 2 T. of the honey. Purée mixture with a stick blender – or transfer mixture to a food processor or blender to purée until almost perfectly smooth, then transfer mixture back to stock pot. Stir orange juice and remaining 1 T. of wine into carrot mixture, then thin soup to desired consistency with the remaining broth. Stir in orange zest. Taste. If necessary adjust flavor using honey, wine, orange juice, or salt and pepper. Cook over low heat for about 10 more minutes before serving to blend flavors. Stir soup before serving. 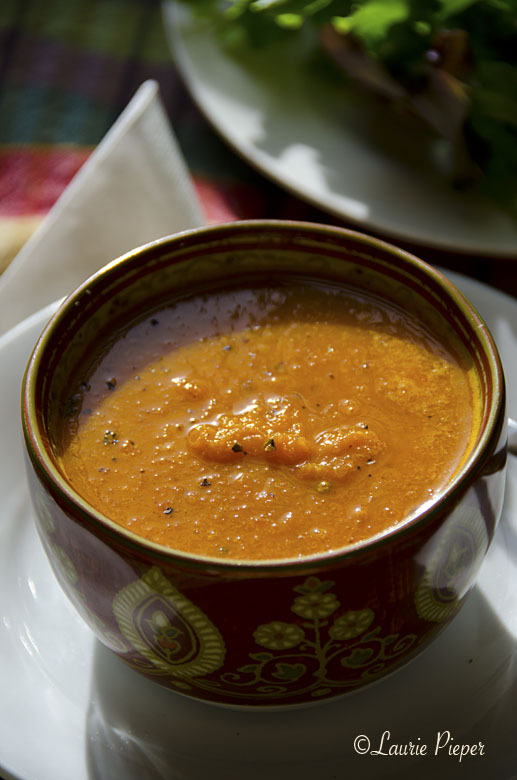 Serve in small cups as a starter or light lunch – or in soup bowls for a heavier meal. If desired, garnish with croutons or a dollop of Greek yogurt. The combination of chopped onions, celery and carrots, sautéed in olive oil (to make what Italians call soffritto) or in butter (to make what the French call mirepoix) is wonderful for adding flavor to sauces, soups, stews and stuffings. Around the holidays, I keep soffrito or mirepoix in the refrigerator so that I have the aromatic vegetables already prepared to make holiday cooking easier. I generally use about 1 to 1.5 tablespoons of butter or extra virgin olive oil per cup of raw vegetables, adding a dash of salt and pepper. To the onions, I also add a splash of dry white wine. For this minestrone, I prefer olive oil to butter, but either will work. If you have soffritto already made, you can substitute 3 cups of it for the vegetables in this soup and reduce the olive oil to 1 to 2 tablespoons. 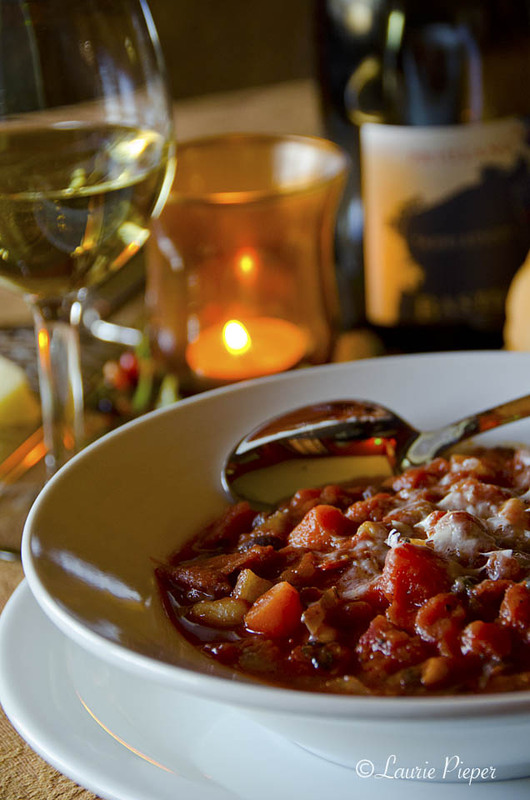 This is a delicious, stew-like minestrone … flavorful and filling for the winter months. If you prefer a more brothy soup, you can thin this with a little vegetable or chicken stock. (1) If you do not have soffritto already prepared, start by sautéing vegetables in olive oil, one type at a time, using about 1 – 1.5 tablespoons of olive oil, and a dash of salt and pepper, per cup of vegetables. I like to add a splash of dry white wine to the onions. Cook briefly until crisp-tender. (2) Add prepared vegetables, wine, about 1 T. of the remaining olive oil, tomatoes, beans, and spices to a large pot (6-8 qt). Cook over medium heat, stirring occasionally, until the minestrone comes to a simmer. Reduce heat and cook at a low simmer, continuing to stir occasionally, for about 15 minutes. (So that the vegetables remain crisp-tender, don’t overcook.) Taste. Add more olive oil, wine, or seasonings if desired. Ladle into warm bowls to serve. Serving suggestion: At the table, grate a little cheese over each bowl of minestrone – but not for vegans. Serve with warm bread and a glass of wine. The other morning, I had a guest on an almost vegan diet; so I made these delicious muffins which one would never know were free of dairy products and eggs. I hope that you enjoy the recipe! 1. Preheat oven to 400 degrees F. Spread coconut on a baking sheet. Toast in oven for 3 to 4 minutes or until just starting to turn golden at the edges. Remove coconut from baking sheet and set aside. 2. Meanwhile, prepare 12 standard muffin cups or 10 four-ounce ramekins with baking spray. 3. In a large bowl, whisk together flour, sugar, 2 T. of the instant coffee or 2 t. of the espresso powder, and baking powder. Set aside. 4. In a medium bowl, whisk together bananas, coconut milk, canola oil, and rum. Stir banana mixture into dry ingredients. Fold in chocolate chips. 5. 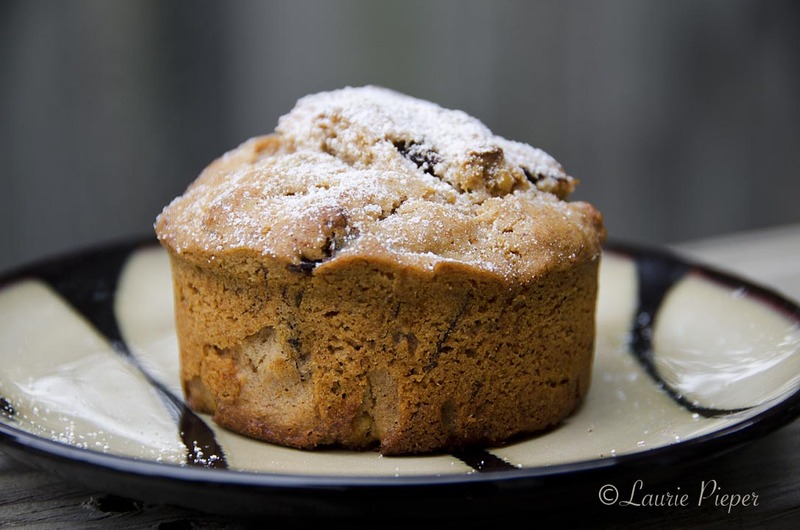 Divide batter into ramekins or muffin cups. Using the back of a spoon, shape each cup of batter into a slight mound. 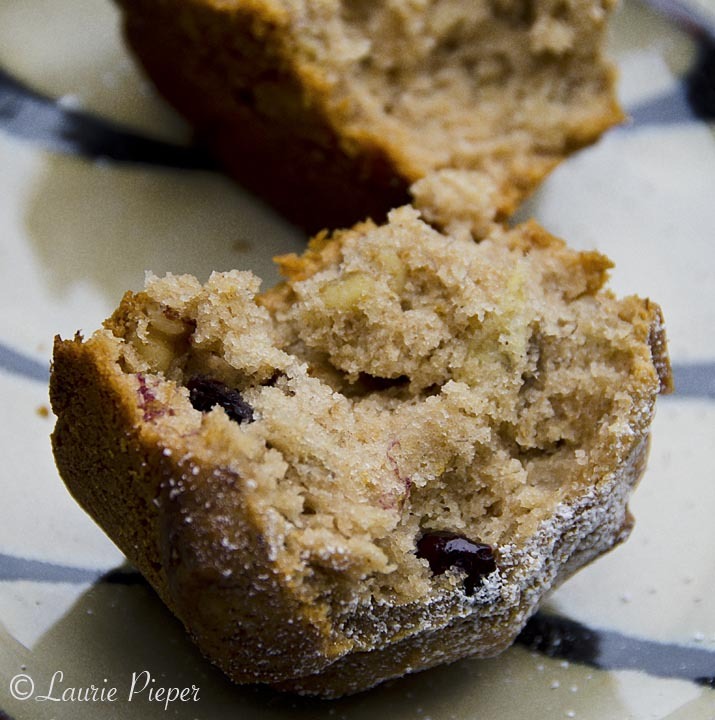 Bake 15 to 20 minutes for 12 muffins or 20 to 25 minutes for 10 muffins. Muffins are firm to the touch when done. 6. Meanwhile, prepare Coffee Coconut Milk Glaze. 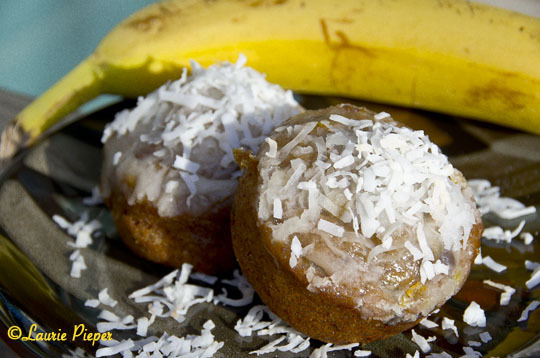 Glaze muffins immediately upon removing from oven and then sprinkle them with toasted coconut. 1. In a small bowl, slowly stir coconut milk into confectioner’s sugar. Stir in coffee, then zest, then rum or extract. Stir until smooth, then warm glaze to dissolve coffee. Indian Pudding is a traditional New England dessert which can be traced back to the 18th century. I developed a fondness for it when I lived in the Boston area. For some reason, though, it is relatively unknown outside of New England. When British settlers moved to this country they brought their Hasty Pudding recipes with them. I’ve never had Hasty Pudding, but apparently it is a dish made from wheat cooked in water or milk until it develops the consistency of a porridge. Wheat was in short supply in New England, so the settlers adapted to the new world by substituting corn meal – which they called Indian flour. Being along a trade route with plentiful molasses and spices, they embellished the dish with these flavorful additions as well as with dried fruits and sometimes nuts … and thankfully, the new dessert, Indian Pudding, caught on. (2) Cook the cornmeal Bring the milk (or substitute) to a low boil then whisk in cornmeal. Reduce heat to low, and continue to cook, whisking frequently until the mixture thickens and the cornmeal is softened (about 15 to 20 minutes). (3) Add remaining ingredients Whisk together the remaining ingredients. Once the cornmeal mixture has thickened and the cornmeal has softened, set it aside to cool slightly and then whisk in the mixture of remaining ingredients. If you are not using eggs, then you can skip the brief cooling period. (4) Finish cooking Pour the pudding mixture into greased baking dish or crockpot. Bake in the oven for 45 to 60 minutes; or cook in the crockpot for 2 hours on high heat or 4 to 5 on low heat . The finished “pudding” will be quite thick. 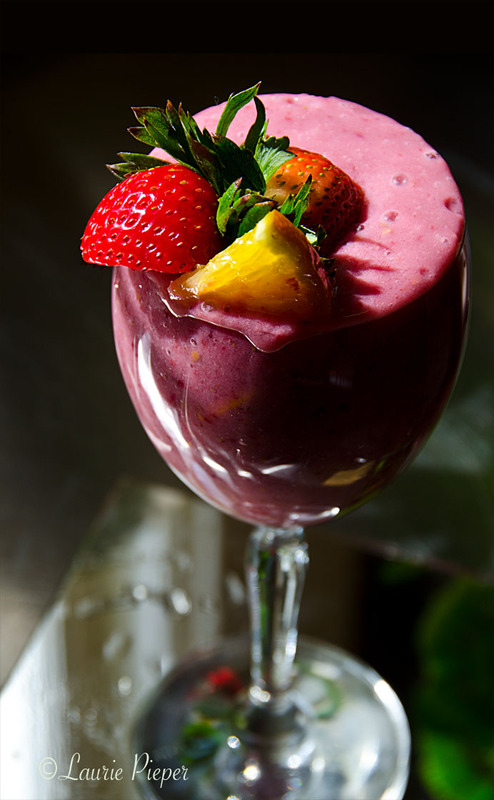 (5) Serve Serve hot with ice cream or whipped cream and serve leftovers cold with ice cream, whipped cream or just milk.